Have you ever wanted to go to Wakanda? You know, the fictional country from the world of Marvel Comics that was recently brought to life on the big screen in Black Panther? The Atlanta Airport, at least in the spirit of good fun, has you covered. 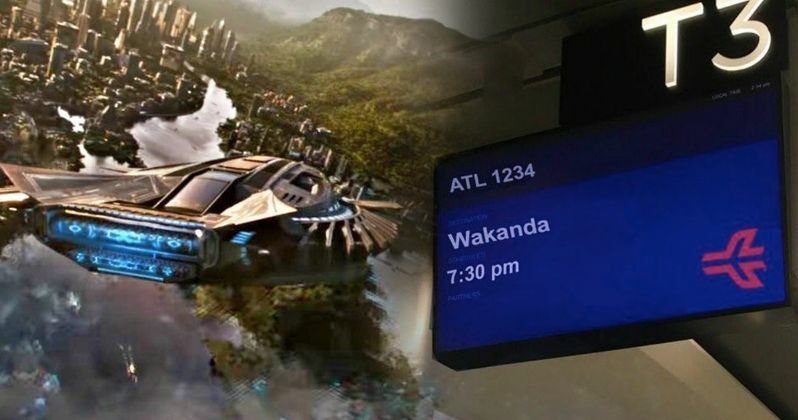 Even though you can't actually go to Wakanda, as the African nation doesn't exist in the real world, the Atlanta Airport is (jokingly) offering flights to T'Challa's home nation in honor of Black Panther's release over the weekend. The official Twitter account for the Hartsfield-Jackson International Airport in Atlanta recently tweeted out a photo of one of their gates, with a flight to Wakanda featured on the screen. Most people seemed to really dig the nod to Black Panther, as it has been retweeted nearly eight thousand times, as of this writing, with more than 17 thousand likes on Twitter. It's all fun and games until someone gets mad that they can't actually book a flight to Wakanda on Tripadvisor. The airport made it quite clear that they were just getting in on the Black Panther fun in their caption. "The bags are packed #WakandaForever"
Even though Wakanda is a fictional place, it's become very real for many people following the release of Black Panther in theaters over the weekend. Director Ryan Coogler managed to make the nation a real character in the Marvel Cinematic Universe and many fans have truly taken to it. Though, there are others who have tried to rain on the parade. A theater in Illinois recently sent out a hilarious apology to trolls who were getting on their case for using Wakanda in their promotion for Black Panther. Even with that in mind, the majority of people seem to be in love with the movie and do understand that Wakanda is not a real place. Black Panther has become an absolute cultural phenomenon. Wakanda may not be real, but it looks like Marvel is going to make the kind of money one would expect from selling a mountain of vibranium to the highest bidder. With the final box office receipts tallied, Black Panther brought in a record-breaking $242 million over the four-day President's Day weekend. That absolutely obliterated any and all expectations. At one point, many thought this movie was going to make less than $100 million opening weekend. And if the movie had made somewhere in the neighborhood of $100 million, it still would have been considered a big success. So this is truly astounding. The movie was aided by very positive word of mouth from critics. So positive, in fact, that Rotten Tomatoes has placed Black Panther atop their 100 best movies of all time list, above The Wizard of Oz. Black Panther has also already surpassed the entire domestic box office brought in by Justice League, just to lend some perspective on just how well this movie is doing. Wakanda forever, indeed. You can check out the post from the Atlanta Airport Twitter account for yourself below.